Ivan has a look at me attitude, at two weeks old he would try to kick the other donkeys off the hay pile ( not sure why, he didn't eat the hay he just stood in it, but he thought he should be in charge). He has a spark in his eye that you can not miss, especially since he always comes up to see what you are doing in his pasture! 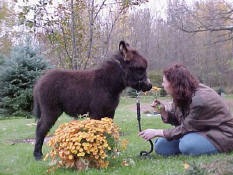 He is a very sweet and fun foal to have around. Sold to Rob and Janet Ellis of Rockford Michigan. 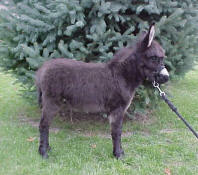 Because of all the handling Cash had in the first days of life he doesn't know that he is a donkey. He would much rather be with us then be with the rest of the herd. Cash thinks the only reason that we come out to the pasture is to see him. 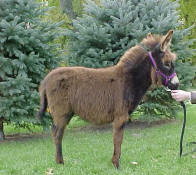 If we dare brush another donkey he pushes them out of the way, he knows we meant to brush him. Cash is in training to be our cart donkey. This could take a while we are all learning as we go. 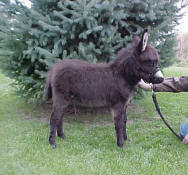 Thank you and congratulations Rick and Kristie Bixby on your purchase of Cash and Phoebe. The Bixby's are from Petoskey MI. Gracie was the first foal born on our farm and what a surprise. We where waiting for a spot and here is a beautiful little black girl!! She was born black and then sun faded to brown now she is shedding out black again, being first time parents we still don't know what to expect. Gracie is a joy to have around, she gave George quite the suprise when she went up and started to scratch his knee! Being our first little girl, she will be staying on our farm. 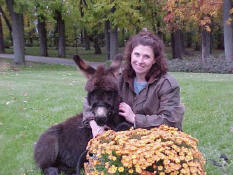 Congratulation to Barbara Ferguson on the purchase of her first two donkeys, Gracie and her foal GG. 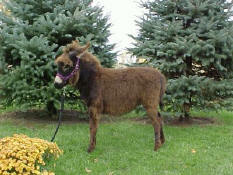 Barbara is from Cedar Spring MI.